The IBM Anyplace Kiosk Model 135 provides the platform you need to run self-service applications in virtually any environment. It is Web-enabled and multimedia-ready, with ample processing power and multiple peripheral options. The Model 135 has a 15-inch Dual Bulb, Active Color LCD as well as a headphone port and a microphone port. It comes standard with an Intel Celeron M Processor 320 (1.3 GHz, 400 MHz front side bus, 512 KB cache). Also, a 40 GB hard disk drive is available as an option. The VESA mount on each unit provides the ability to mount it nearly anyplace: on a wall, in a shelf, on an end cap, tabletop, or pole, or even in a floor-standing enclosure. 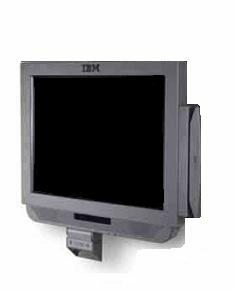 The IBM 4836 Model 135 standard features include a 15-inch Active Infrared Touch Screen, Intel Celeron M320 (1.3GHz) Processor, 256Mb Memory, Multimedia, and a Presence Sensor. A 40Gb Hard Drive is optional. In addition, hardware options such as wall mounts or table top mounts help tailor the system to your business needs and enhance brand perception.